In the summer of ’04, Shorty Harris’ discovery gave rise to a true gold stampede. He named it Bullfrog because the hunk of ore that he held in his hand was dark green in color and he thought it looked a little bit like a bullfrog. 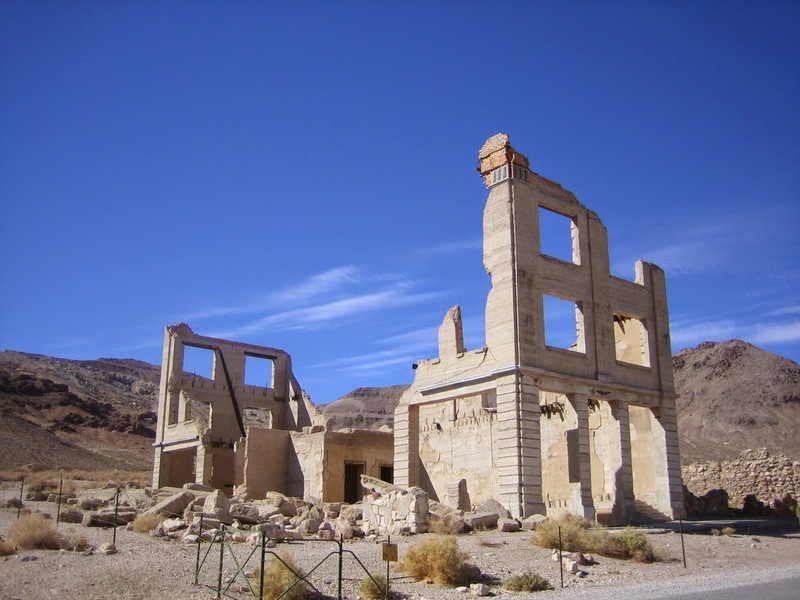 Gold strikes soon took place to the east of Bullfrog which caused the center of commercial activity to shift in that direction to a new camp known as Rhyolite. Over the next year mining claims sold and resold as was usually the case with new discoveries. The gold fever frenzy doubled and then increased some more as the Rhyolite Herald reported, Men on foot, burros, mule teams, freighters, light rigs, saddle outfits, automobiles, houses on wheels – all coming down the line from Tonopah and Goldfield raising a srting of dust a hundred miles long. Locals believed that a great future lay ahead for the district as stone and brick buildings quickly replaced tent houses and wooden stores. Prices for building lots and mining claims soared even before extent of the ore bodies had been determined by government geologists. 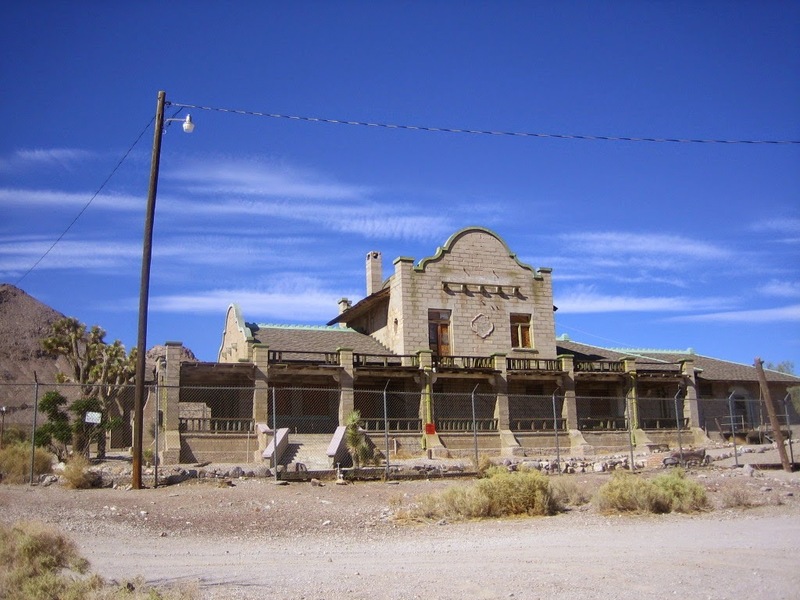 By 1906, Rhyolite had become a modern western city with new construction moving in all directions. Survey stakes marked the rights-of-way for two railroads that would connect the town with Las Vegas to the south and Tonapah to the north. J.P. Loftus, a graduate of Amherst, arrived in Rhyolite to do some investing for a friend who wanted to own a gold mine. His astounding over-night success as a mine speculator and stock manipulator might have raised a few eye brows if it hadn’t been that everyone else enjoyed the same success. 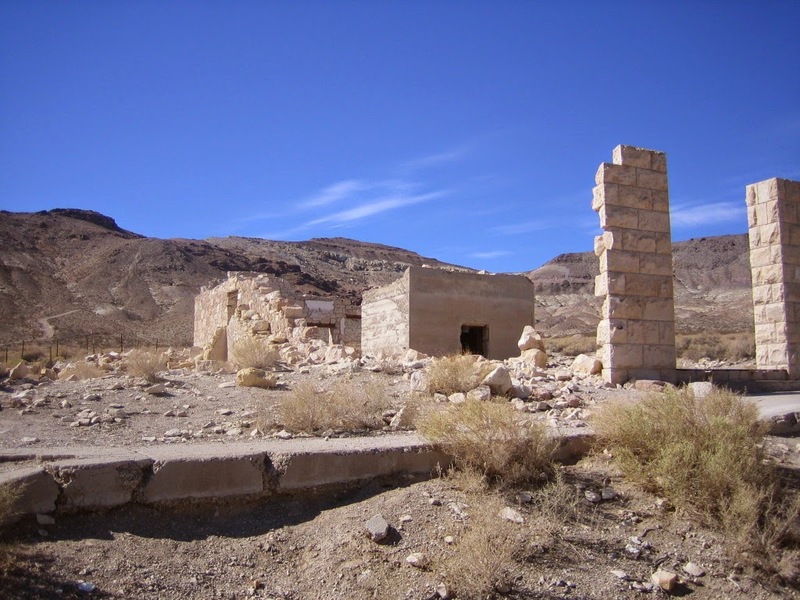 A gold mine a few miles north of Rhyolite showed good test results and became the Bullfrog Gold Bar Mining Company owned by Loftus and his new partner James R. Davis. The enterprise received wide acclaim causing share prices in the company to climb. Equipment soon arrived at the site and within a few months ore was being lifted out of three shafts. A few pockets within the mineral belt produced ore as high as $1,500 to the ton, but the average ran below one-hundred dollars. In order to be profitable, a mill had to be constructed on site. Orders were placed for ten milling stamps and the necessary attachments for collecting gold. By early months of 1908, the mill was up but only marginally operational. The partners gave the press glowing reports and share prices in the company hit new highs. Loftus stated that there was enough ore blocked-out below ground to keep the mill running full time for years. The industrialist Charles M. Schwab took an option to acquire the property for a reported one million dollars. Schwab extended the option a number of time before deciding to drop the deal. He claimed that the San Francisco earthquake put a damper on his enthusiasm. Less than six months from the beginning of operations the mine and mill were sitting idle awaiting construction of a new pipeline. At the same time, a local newspaper reported that 200,000 shares of the companies stock had been sold by a bank in the mid-west. The dumping of that many shares caused share-price to sharply decline. Undisturbed by unfolding events, the two partners left the district for a two month tour of Europe. Loftus stated that they would look into matters when they returned. A current of suspicion ran through the camp that the shares dumped on the market belonged to Loftus and Davis. While the partners toured Europe, their attorney representing, the Nevada Exploration Company, placed the Bullfrog Gold Bar Mining Company into bankruptcy proceedings over a loan that was made to help finance the mill. Interestingly, the sole owners of Nevada Exploration Co were non-other than Loftus and Davis. In effect the partners brought suit against themselves which under Nevada law was perfectly legal. “Fraud of the Worst Kind”, cried the Rhyolite Herald as the bankruptcy court passed ownership of the Gold Bar Mine to Loftus and Davis. The court awarded nothing to those still holding shares in the Bullfrog Gold Bar Mining Company. The partners returned from their European trip sole owners of the mine and the mill. As full owners, a new company was formed that offered stock at a discount to those who had lost their money in the Bullfrog Gold Bar Mining Company. The full story unspooled in local newspapers giving details that were uncovered from company records and findings in court documents. Threatening Letters soon appeared in the papers from the dispossessed a few recommended a hanging. Facing public outrage, the partners quietly discontinued attempts to sell stock in the new company and each took early retirement. Loftus, in later years, from his home in Santa Barbara, claimed that it was the responsibility of those who invest in mining stock to look to their own interest. He had no regrets. In 1907, the federal government issued its report on mines within the Bullfrog district. In summery, the report stated: “It is evident that the prosperity of the camp must depend on the successful working of ore much inferior in grade [to that found in Goldfield]”. Wow. The report supported what many mine owners already knew. Decline in production and the high cost of recovery spelled the end. By 1910 the population of the Bullfrog District had dropped from a high of 10,000 to less than 500. 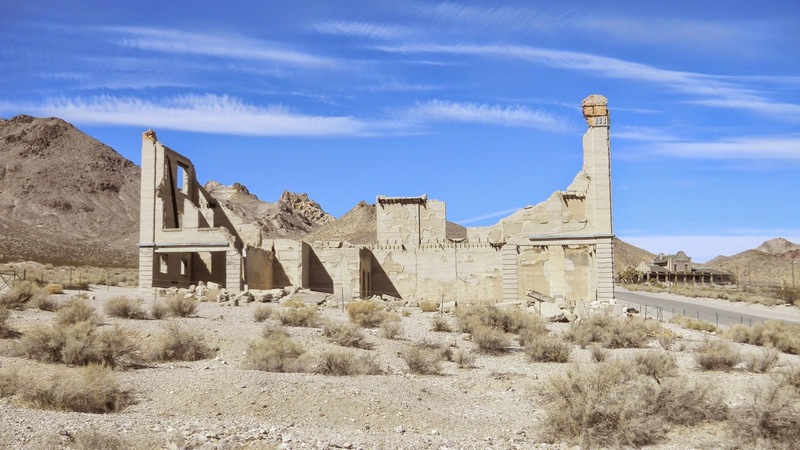 The scenic ghost town of Rhyolite is locate about 4 miles west of Beatty, Nevada on Highway 374. Well worth a visit. 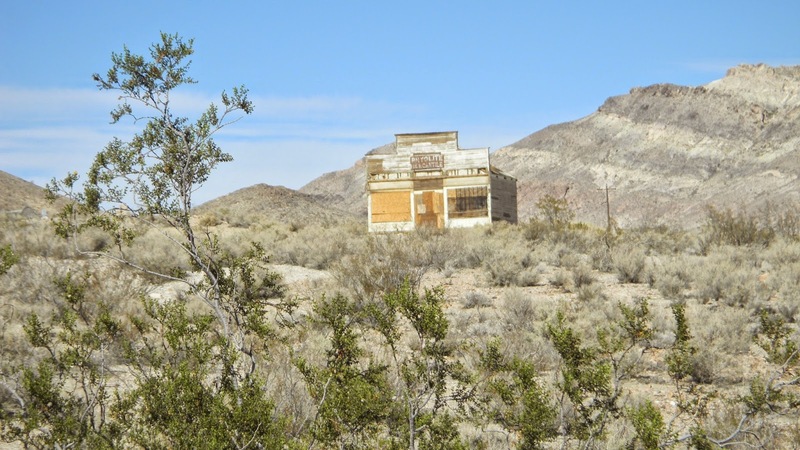 The "Beatty Mercantile" shown in the second photo burned to the ground in Sept 2014. It was hit by lightning.